"Precursor Tank" 4-4-2T No. 1589 poses at a mystery location - where?. The distinctive building in the background ought to be easily recognisable. This is at Lichfield, looking west. The engine is on the spur from the Trent Valley line at its junction with the South Staffordshire, whose tracks are in the foreground. The buildings behind are part of the Trent Valley Brewery Co.
Could this be the Crewe Line just outside Shrewsbury station with Ditherington Flax Mill (later Allbrew Maltster’s Shropshire Maltings) in the background? Studying the OS 25” plan (1921 revision) shows that the light horizontal band left of the signal post and in line with the engine footplate is along the platform at Lichfield Trent Valley station, a fence maybe? Harry is undoubtedly right. The curve between HL and LL was double track until the Trent Valley resignalling of 1962/63, and the loco is on the trailing crossover between the Up and Down lines of the curve. My guess is that it has come from Lichfield City on the Down line, reversed, and is going down the curve to the Low Level. Note that it is carrying a ”local pass“ headlamp code (no.2 lights) — or is that a tail lamp? Any guesses as to date anyone? The date is before the LMS renumbering in March 1924. 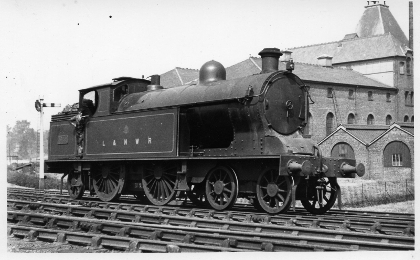 The sandpipe has a windshield, but apart from that there seems to be nothing at all to suggest a date closer than ‘about 1920’ as in the caption to plate 451 in Ted Talbot’s ‘An Illustrated History of LNWR Engines’.